The Supersonic AirKnife enables the excavation of sensitive areas without fear of damaging roots. This has opened up new opportunities in diagnostic work, soil remediation, and excavation close to trees. The danger of damaging tree roots or even underground utility lines is no longer a concern with this tool. The AirKnife we use has been imported from the USA where it is manufactured by Easy-Use Air Tools, Inc. The tool's design has been scrutinized for over eighteen years to perfect it in a multitude of real life circumstances, although it has only recently been adopted by a small number of arborists for use in the UK. New techniques are being discovered and developed that will make these tools the next arboricultural frontier. In the near future, in order to offer "complete tree care", arborist's will need to utilize Supersonic AirKnife technology. The AirKnife opens a new world of tree care. For the first time we can work with the underground portion of the tree where 90% of health problems originate. The AirKnife converts compressed air from a portable compressor to a supersonic jet stream by using a specially engineered nozzle. 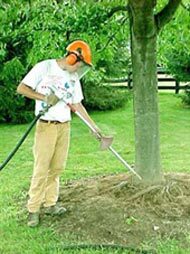 The finely focused stream of air penetrates the ground to a depth of up to 30 cm and can be aimed to crumble and blast the soil away as fast as the operator moves the tool. Since tree roots, rocks and pipelines are non-porous soil can be excavated quickly with no impact to roots, electrical, or gas lines.